Lock in a great price for Villa Mela Hotel – rated 9.1 by recent guests! I had a great room, the bed was big and comfortable, the shower hot and clean. And staff were great! 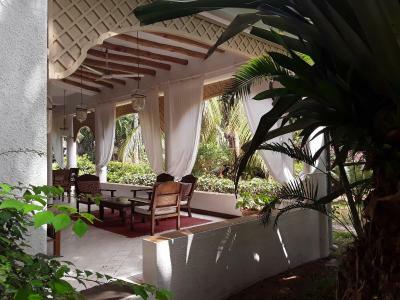 This is the perfect place to relax as well as be close to the beach and a short tuk tuk ride to the town. Staff are lovely, breakfast delicious and the decor is gorgeous. We returned here on our final night because we liked it so much. Special treatment by the manager / owner, who collected us free of charge from the airport. Great place to relax. Lovely garden, nice pool and very nice lobby and sitting area. Quiet location within a small home. Great staff who were attentive, friendly and welcoming. The owner was amazing and helped us with recommendations for places to eat. Breakfast was amazing with fresh fruit. My CC had been hacked and the owner was so helpful nothing was inconvenient for him. Nice place hidden from city noise with a lovely garden. Room was nice and clean, the villa is in enclosed safe area and the stuff is friendly and helpful. 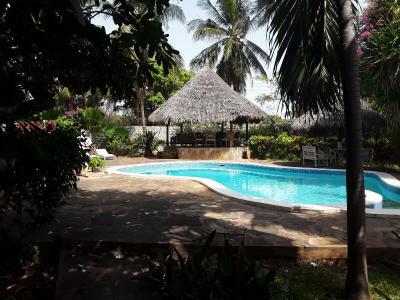 Villa Mela Hotel This rating is a reflection of how the property compares to the industry standard when it comes to price, facilities and services available. It's based on a self-evaluation by the property. Use this rating to help choose your stay! 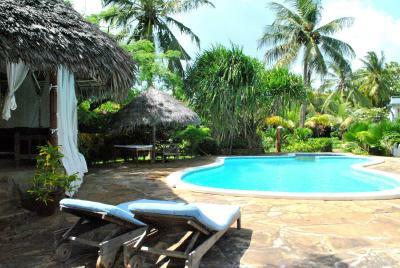 Featuring a lush garden with a pool, Villa Mela Hotel is located in Malindi, within 1,650 feet of the Indian Ocean. It has a restaurant and a bar, and offers massages and a fitness area. 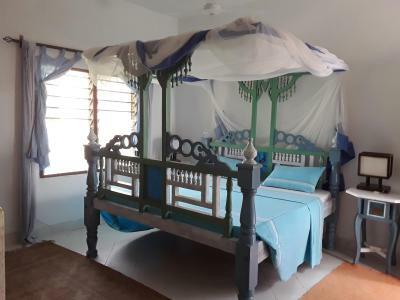 Each room at the Villa Mela faces the pool garden and includes characteristic wooden beds equipped with mosquito net. 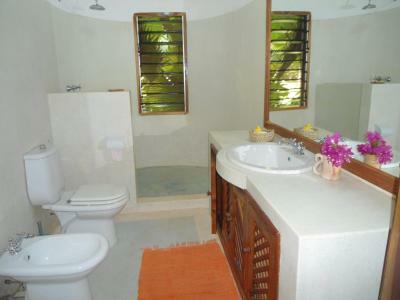 They are all air conditioned and come with a private bathroom fitted with bath, shower, and hairdryer. The restaurant offers specialties from the local area mixed with classical international dishes. 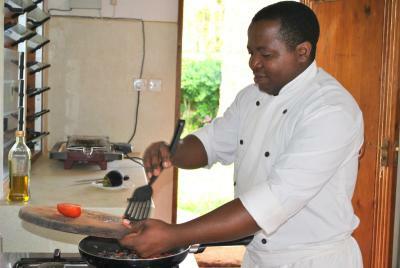 Barbecue facilities are also available for those guests who prefer outdoor meals. 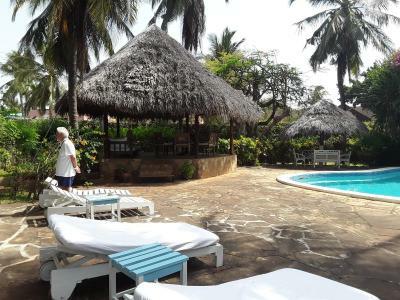 Silversands beach is only 5 minutes’ walk away, while the Malindi Marine National Park is 1,650 feet away. The local airport is 2.8 mi away and the hotel can arrange a shuttle service upon request. 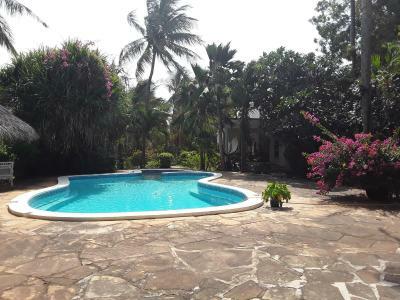 This property is also rated for the best value in Malindi! Guests are getting more for their money when compared to other properties in this city. When would you like to stay at Villa Mela Hotel? 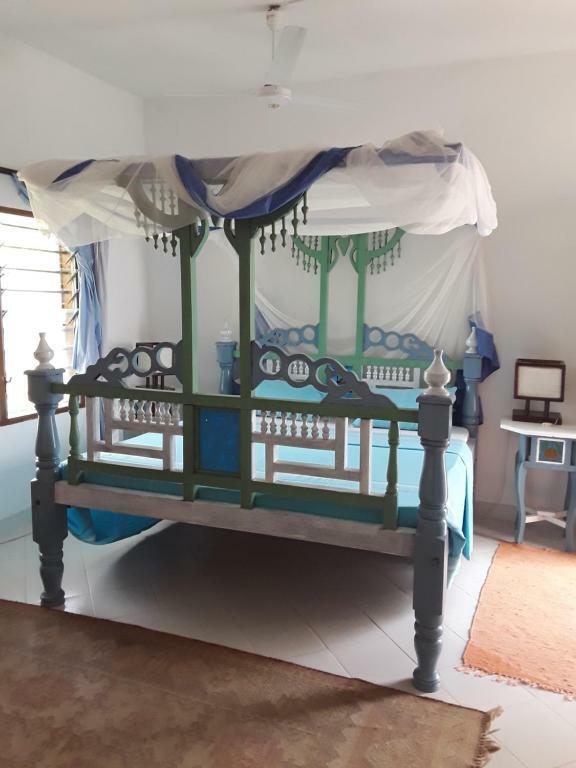 Featuring views over the garden and the pool, this air-conditioned room includes a characteristic wooden bed equipped with mosquito net. The spacious and airy Double Room includes a private bathroom fitted with bath, shower, and hairdryer. House Rules Villa Mela Hotel takes special requests – add in the next step! A deposit via bank wire is required to secure your reservation. Please contact the Hotel for more information. Breakfast was not served on time, therefore we had to leave for the airport with an empty stomach. 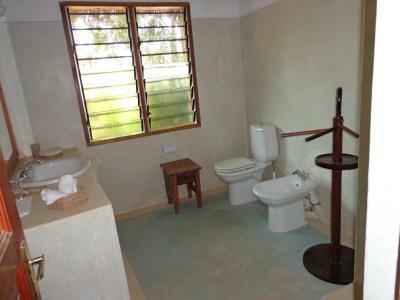 It's a bit far from the Malindi town and the windows in the bathroom can't be fully covered so one feels like people from outside can see him showering. Breakfast is nice, but exactly the same every morning and dinner was available only, if you pre-ordered. At the same time one can find several eating places nearby. Private, quiet place for a holiday. Nice, friendly and helpful staff. If you have older children (teenagers), then over 2m deep swimming pool is perfect for them to jump in :) We enjoyed a lot. And lovely and very nice garden, a lot of different plants. Pergolas and many sitting places to stay in a shade. You have to consider 6-7 min walk to get to seaside, but it's OK. To the town and back, tuk-tuks you can get easily from the main road (150 m). And for swimming Marine Park beach is perfect (5 min by tuk-tuk). When I arrived at the property, I was told that they were overbooked. I was offered the owner's rooms instead, along with dinner each night as compensation. My booking was non-refundable and I had no transport so didn't really have an option. In addition, I felt bad for the owner's personal situation (he has lost his voice to throat cancer) and assumed there had been a technical error in the system that was outwith the owner's control, so I agreed to stay. 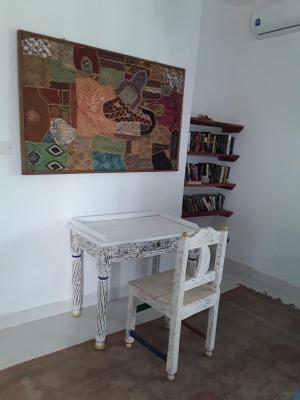 Strangely, however, about an hour after I moved in, a woman came to the door, identified herself as a friend of the owner, and insisted on showing a tourist the room; apparently he was interested in renting it. The accommodation I was given was nothing like the room I should have had. It was cramped and full of the owner's personal effects, which meant I couldn't even unpack my suitcase. It also lacked AC and several other amenities that I had booked and paid for. In addition, when I ordered (it is a small place, so you have to pre-order) my complimentary dinner that night, I was told I could either have a first course or a second course, but not both. 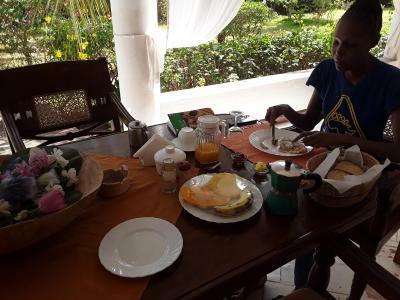 At breakfast the following morning a staff member insisted that I pay the entire cost of my three-night stay up front, which took me by surprise; this must be the first time I've ever had to do this at a property. I took the opportunity to ask him about the overbooking and was told that the owner had knowingly given my room away to a couple who had arrived before me and wanted a second room for their child, which left me feeling shocked. 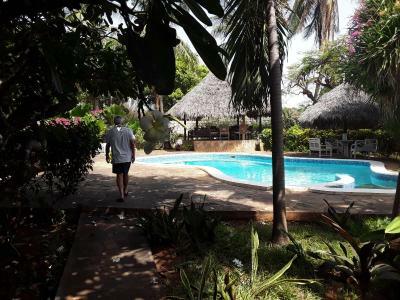 The actual accommodation I had booked looked really nice, the common area was pleasant for lounging around in the evening and there was a nice pool. 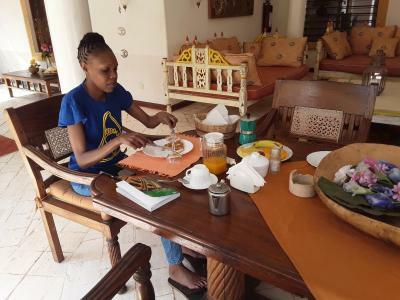 Breakfast was also good for such a small guesthouse. The location was only a 7 or 8 minute walk from the beach. 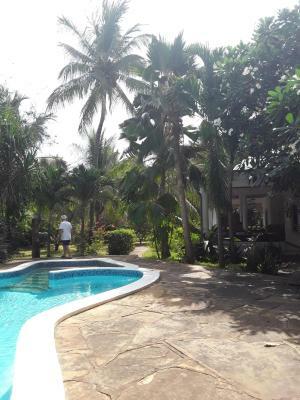 Before arriving at the property, I was contacted directly by the owner asking for some kind of payment before arriving (in more than 20 years of travelling this was a first for me). I replied that I would be happy to give him a deposit, and he told me that I could do that on the day. 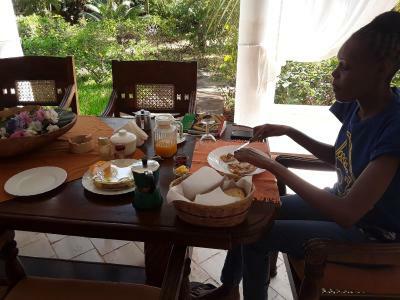 When we arrived, the staff promptly asked us for the promised deposit, stating we could pay in full up front (we did not and settled the bill the day we left). When we asked if we could have lunch, the staff appeared very impositioned, and when they said it would take an hour and half to grill two chicken breasts and steam some vegetables, that is exactly what happened. We were not given any orientation to the property or how anything worked. When we returned that evening after some sightseeing, we were hoping to have dinner at the property. However, the staff had all left, and other guests had to tell us that dinner has to be requested earlier in the day or the staff goes home. Thus, we had to go back out and find a place to eat. The hotel is also not located near any of the sights except for a small beach 5 minutes away. We had to take tuk-tuks everywhere. 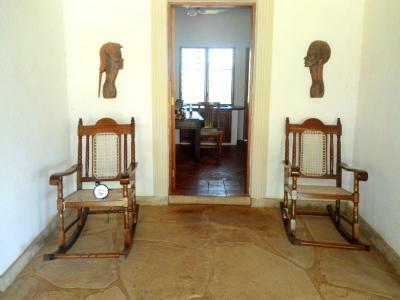 The property was very clean and the facilities were lovely. Breakfast is included and was good and hearty. Sub letting of the property. The old man who picked me from the airport though he could not speak as he is suffering from throat cancer. I wish him a quick recovery. Such a beautiful place! Clean and comfy with a big common area to spend your evenings and a clean pool if you need to cool down in the afternoon. 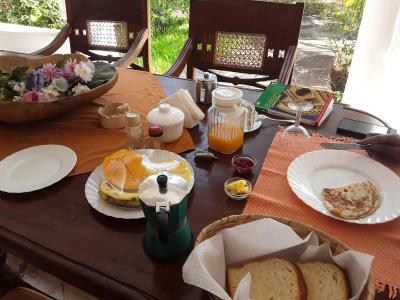 Also breakfast was perfect and the location is just 15 minutes walk to the center and even less to the beach. Special thanks to Steven who helped us with everything we needed and made us feel like at home. We hope we will be back!